Francisco Kjolseth | The Salt Lake Tribune Water flows in Big Cottonwood creek with the last of the fall color on Thursday, Oct.
Francisco Kjolseth | The Salt Lake Tribune Water flows in Big Cottonwood creek with the last of the fall color on Thursday, Oct. 31, 2013. 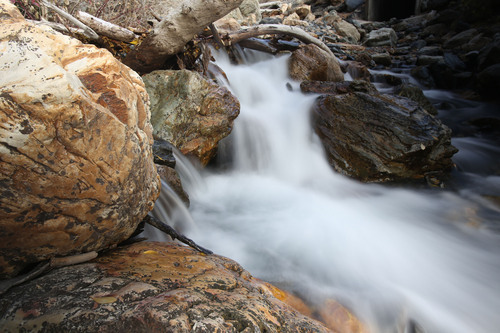 A new study from the (NOAA) National Oceanic and Atmospheric Administration's Cooperative Institute for Research in Environmental Studies at the University of Colorado Boulder looked at the possible impacts of climate change on Salt Lake City's water supplies, including four streams - City Creek, Parley's Creek, Big Cottonwood Creek and Little Cottonwood Creek. Ignoring or downplaying the potential of climate change to make life in Utah much different  and drier  in the future won&apos;t make the impacts go away. Policy makers must acknowledge what&apos;s happening and act to mitigate the inevitable. Conservation must be the key, not continued reliance on the next big water project. Research conducted by a team of climate scientists, hydrologists and water utility experts shows just how much a seemingly small increase in average temperatures will threaten Salt Lake City&apos;s water supply coming from snowpack in the Wasatch Mountains, which is important to other communities as well. Their report, published in the journal Earth Interactions, indicates that for every 1-degree increase in temperature, annual water flow from mountain watersheds could drop an average of 3.8 percent. Further, it would take a 10 percent increase in annual precipitation to counteract a 5-degree increase in temperature. Average temperatures are already rising steadily in northern Utah  about 2 degrees in the past century  and at an ever-increasing rate. Summer temperatures have risen especially fast in recent years and are expected to continue the trend. Salt Lake City experienced the warmest summer ever this year. And this year&apos;s record was just the latest in a more than decade-long warming trend. Including this year, the seven warmest Julys on record in Salt Lake City have all occurred since 2002. Hotter temperatures during the summer irrigation season will increase water demand and decrease water supply. The study shows a 5-degree temperature increase would send the peak water flow two to four weeks earlier, meaning, while there may be more precipitation in the form of rain, there will be less water stored in reservoirs. Mormon pioneers set up an extensive irrigation system to collect and distribute runoff water from mountain snowpack, recognizing that irrigation was essential for farming. As the Wasatch Front has become more urban, residential and commercial water uses have replaced agriculture in the Salt Lake Valley. But the water supply still comes from mountain watersheds, which rely on heavy snows in winter and a gradual melting in spring. Climate change will alter that process. The changing climate also will reduce the volume of the Colorado River and it tributaries. There simply will be less water for everyone, and that fact should inform Utah policy.